Prof. Tim Fisher has agreed to become chair of the Department of Mechanical and Aerospace Engineering for a five-year term starting July 1, 2018. Tim is a highly-regarded researcher in heat transfer, a terrific teacher and mentor, and a deeply-respected member of the thermal-fluids community. Tim replaces Chris Lynch, who will become Dean of the Bourns College of Engineering at UC Riverside. Timothy S. Fisher is a professor of mechanical and aerospace engineering at the UCLA Samueli School of Engineering. He leads the Nanoscale Transport Research Group, which studies transport processes by electrons, phonons, photons, and fluids, with an eye toward addressing problems in aerospace, energy, micro- and nanoelectronics, and sensor systems. Fisher is also an adjunct professor in the International Centre for Materials Science at the Jawaharlal Nehru Centre for Advanced Scientific Research (JNCASR) and is the co-director of the Joint Centre on Nanomaterials for Clean Energy and Environmental Sensors. 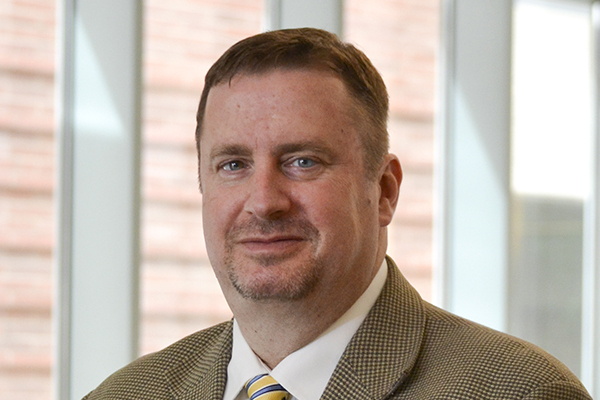 Fisher joined the UCLA faculty in 2017 following 15 years at Purdue University. There, he held the James G. Dwyer Professorship in Mechanical Engineering. He was also the founding director of the Center for Integrated Thermal Management of Aerospace Vehicles, which is supported by the U.S. Air Force and leading aerospace companies. And he was a research scientist at the Air Force Research Laboratory’s Thermal Sciences and Materials Branch of the Materials and Manufacturing Directorate. He started his career in academia as an assistant professor at Vanderbilt University. Fisher is a fellow of ASME and was a recipient of the National Science Foundation’s CAREER Award. He is the specialty chief editor of Frontiers in Thermal and Mass Transport, and is on the editorial boards for Frontiers in Nanoenergy Technologies and Materials, Energy Conversion & Management, Nano Energy and Nano Environment, Journal of Nano Energy & Power Research, and Journal of Nanoengineering & Nanomanufacturing. Fisher received his doctorate and bachelor’s degree from Cornell University. His wife Amy works with UCLA Recreation as a nutritionist and wellness coach, and maintains a private practice in Century City. They have three adult children.